Majority of pitches in our camp offer a view on Soča river. 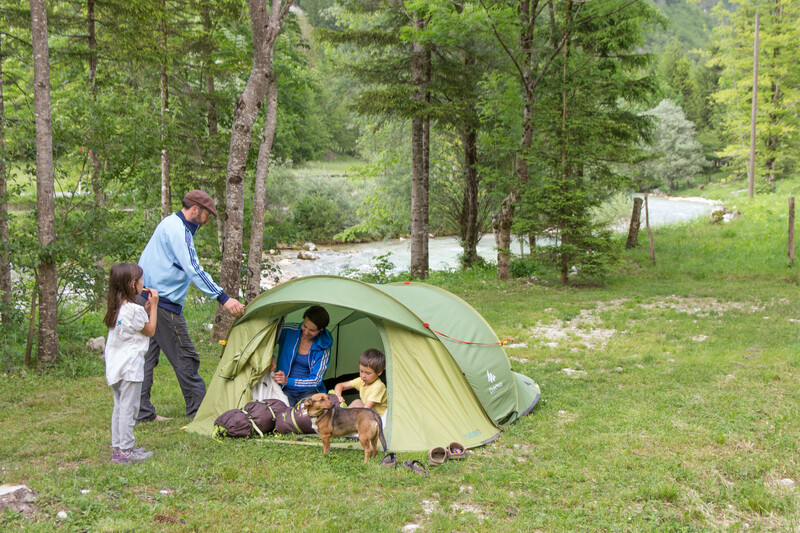 This is most definitely a campsite by the most beautiful river in the heart of Triglav National Park. We have pitches available for tents, campers and trailers. CAR FREE ZONE is a part of the camp just by the river side offers the traditional camping without electricity. On the other part by the reception we have various pitches with electricity plugs available. Note that our camp is small, therefore small tents and small campers fit better in the environment. We also offer a parking lot for cars outside the camping area. There is also open kitchen available in camping area. Just in case you are not bringing your own camping kitchen along. For the gatherings at evenings we recommend the benches next to fire places. On the spots of classic camping we provide bathrooms, as well as two outdoor showers.